Better results than critix's and mine: Checksum computed in cam match with those from PC. I'd like a test on 400D and 30D, if anyone happens to have one. Low priority, just for fun. Edit Feb.10: confirmed on 5DS R.
- User PS: ??? ??? ??? I have a 30D if you want me to try anything. I must admit though that I am an absolute beginner in this space and will need some handholding to get me going. Just download the file for your camera from the first post in this thread to a memory card, then place the card in the camera, and follow the firmware update procedure (it should be explained in the camera's manual, if it is not obvious by following the menus). Read the instructions on the screen, wait until it tells you to take the battery out, then share the new files that got created in the memory card. Run build from 17. Feb. on 7D (classic) two times from a bootable card. Observation: Manual checksum consistent. Checksum computed in cam for ROM0.BIN is inconsistent. if not populated, reading there will give some random noise or fading bits. Some cameras have only ROM1 connected, so dumping ROM0 will give just random noise. 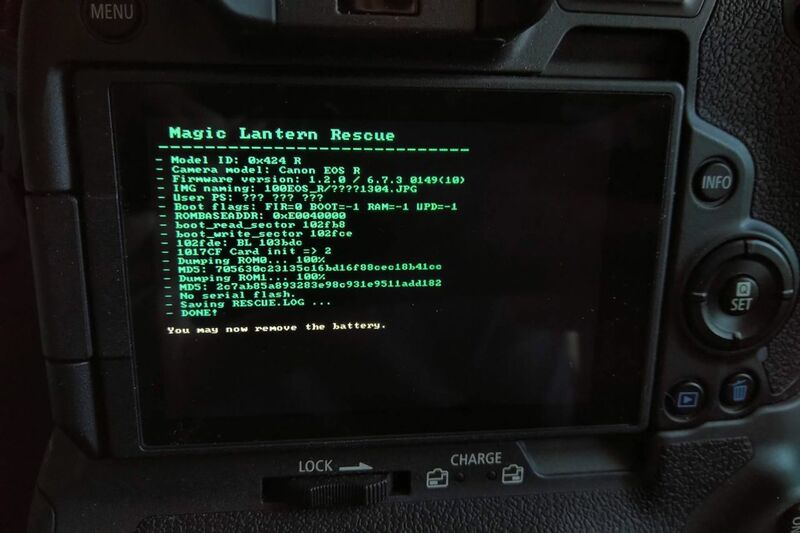 In this case, the ROM0 checksum may not match, but that's OK.
On the "slave" side of the 7D, where this dumper runs, only ROM1 is connected. Reading from ROM0 gives only electrical noise. The dumper doesn't know, or attempt to find out, which cameras use ROM0 and which ones don't. It just dumps both. Thanks, understood. Puzzling (me): Both runs gave exactly the same data for ROM0.BIN. That kind of noise sounds deterministic. Haven't looked into it, though (not my strong side, debugging binaries). EDIT: Fine string of repeating non-sense it is. Yes, it's not exactly Gaussian noise, but rather something with very low entropy. And yes, in some cases it appears to be deterministic, or it may flip only a small number of bits. In any case, it's not used by the firmware, so it's not a big deal if the checksum doesn't match. I can confirm that the latest 77D.FIR works. Checksums displayed (and in RESCUE.LOG) of ROM0.BIN and ROM1.BIN match the values calculated on the saved files. ROM1.BIN dumping and checksum calculation is very slow. Is this still true? Because in the EOS R thead seem solved, right? Maybe this build don't have the fixes for the R ? And maybe will be usefull to have also the .FIR build in first post? If you need dumper for R, I can PM you one (but as autoexec.bin, not .fir), yesterday dumped 1.2.0 firmware so it works . Still won't work without bootflag enabled via UART. From my knowledge, FIR encryption on R / RP is still a mystery.